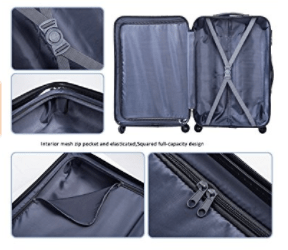 Merax Aphro is a late 2017- brand new release luggage set of three lightweight spinner type suitcases with hardshell ABS exterior at a very affordable price. You have the sturdy and durable yet lightweight 20-inch cabin, 24-inch medium size and 28-inch large suitcase to use for your different leisure and business trips. At the time of this review, you are given the six color options of black, purple, orange, red, blue and gold to choose from and all have the same price tag. They are made of ABS hard shell material that is not heavy but solid, durable, flexible and resistant to potential impact when put under stress. You will get them shipped fitted into each other and this is how you can save on storage space. All the three Merax suitcases have four airplane spinner wheels that rotate 360 degrees in multi-directions smoothly and quietly, with the help of the convenient and sturdy feeling three-step telescoping handles. You can maneuver them easily and effortlessly even in tight areas. They will naturally get scratches on your trips from being in contact with other suitcases and surfaces but these will be well-hidden thanks to its sleek pattern. They include the standard three-digit combination locks so you can have a peace of mind, but please note that these are not TSA locks if you prefer them. The lock is preset to 0-0-0 and you can change it to something you can remember, by simply pressing the broadside and setting each digit to your selection. The smallest cabin size measures 19 x 13 x 7 inches (without the wheels) with a telescoping handle of 7 and 21 inches and weighs only 5.7 pounds. Medium 24-inch suitcase weighs 7.4 pounds and measures 23 x 16 x 10 inches with a telescoping handle height between 9 and 17 inches. The largest 28-inch suitcase weighs 9.4 pounds and measures 27 x 18 x 11 inches, with a handle height between 5 and 13 inches. 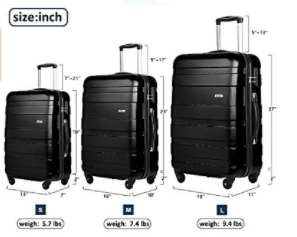 Please just add two inches to the height of the suitcases to include the wheels. As they are lightweight, you will be able to pack more without having to pay for excess luggage weight. You also have the side and top handles so you can hold vertically or horizontally, whichever feels more comfortable. The set is offered with a two-year global warranty by Merax. They are functional, reliable, comfortable to use, safe, stylish, modern and durable and at a price you will like.